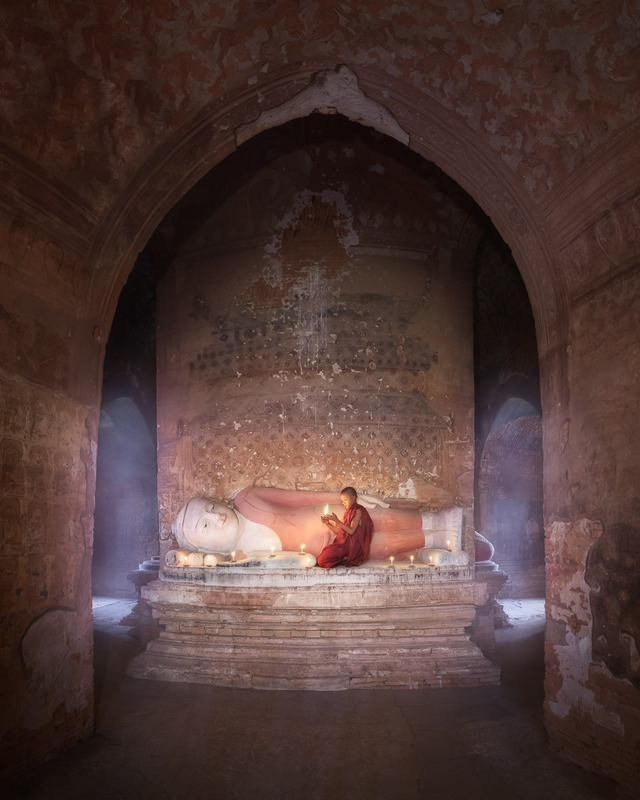 In Myanmar, images of the Buddha were everywhere. Sculpted in stone, carved out of teak, or painted on canvas, there were few spaces not adorned with an image of the Buddha, and often there were multiple images. Some were simple and many others were quite ornate, but in virtually every representation of the Buddha, one thing was the same: the calm, serene countenance of a man deeply at peace. Staged photo, panorama from 3 vertical shots, focal length 14 mm, aperture f/8, shutter speed 1/8, ISO 1600, tripod, 1 led light. As my trip progressed, I learned that images of the Buddha have different meanings — that a sitting Buddha and a standing Buddha could have completely different meanings, for example. But it was images of the reclining Buddha that I came to find most fascinating. At first glance, the reclining Buddha suggests relaxation; the pose is not unlike a person lounging by a pool on a tropical holiday. But the meaning is actually far more profound. The reclining Buddha — a common image anywhere that the faith is prevalent — symbolizes the Buddha in the final moments before his death. Though the exact cause of the Buddha’s death is uncertain, virtually all accounts of his life agree that he was aware that his death was imminent and faced it with a calm acceptance of the impermanence of life. I learned much about Buddhism during my time in Myanmar, but it was this belief, in particular, that I came to find most comforting. Many of us go through our lives consumed with the fear of death—our own or those of the ones we love. But if Buddhism teaches anything, it is that life is transitory, and that death is not an end, merely a transition. It is nothing to be feared. One of the things I love the most about travel is how it changes you. Each new place becomes part of us, altering us in ways that may take us years to understand. My travels in Myanmar affected me profoundly, leaving me with a greater appreciation of life but also the awareness that death is simply another part of life, another one of the many transitions we experience in our earthly shell. And because of the people I came to know in Myanmar, my life has been enriched immeasurably. So beautiful, your travels in Myanmar, and wonderful to see the images of Lord Buddha-his philosophy of life-and death-are profound, and moving.